This article demonstrates how to create a sample application that contains RadSlideView. You can find the assemblies needed by the control in the Required Telerik Assemblies article. RadSlideView is populated via its ItemsSource property. The control will display an indicator for each item in the ItemsSource and display the view of the selected item. You can use the ItemTemplate and ItemTemplateSelector properties to customize the views appearance. To display any items you can set the control's ItemsSource property and populate it with some data. Check the ItemTemplate article to see how to populate the control with business items and customize their appearance. SDK Browser and QSF applications contain different examples that show RadSlideViews's main features. 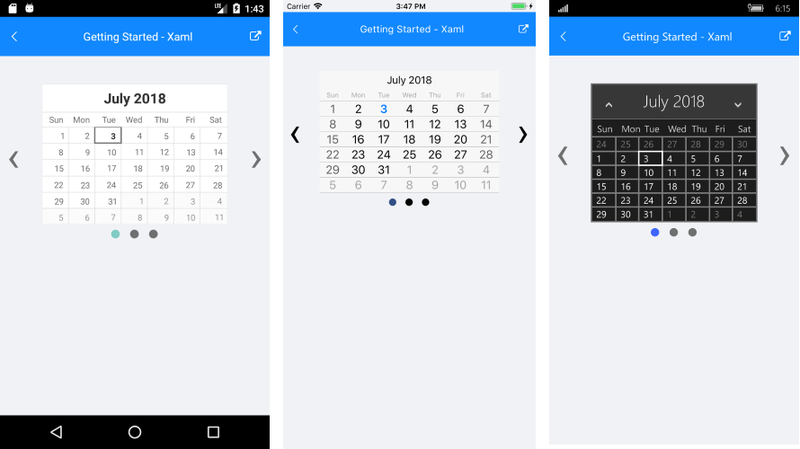 You can find the applications in the Examples and QSF folders of your local Telerik UI for Xamarin installation. Copyright © 2018 Progress Software Corporation and/or subsidiaries or affiliates. All Rights Reserved.